Betsoft does it again with the Lost Slot Machine. Join the adventure with the relic hunter as he searches the Pharaoh’s tomb for buried treasure. The Lost Slot gives you plenty of opportunities to win real money. Spin the reels and experience the exciting and lucrative bonus features. 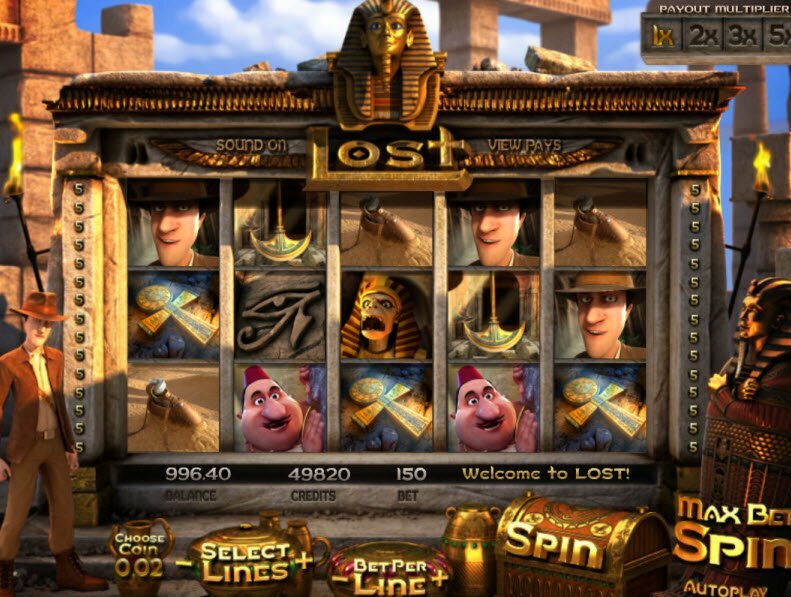 With 30 paylines and a whole lotta bonus features, you’re sure to make some money with the Lost Slot Machine. Join the relic hunter as he explores the mummy’s tomb for buried treasure. Lucky players who access the Mummy’s Tomb Bonus can choose which door to explore. The correct doors reveal prizes, but the mummy may be hiding behind there as well! 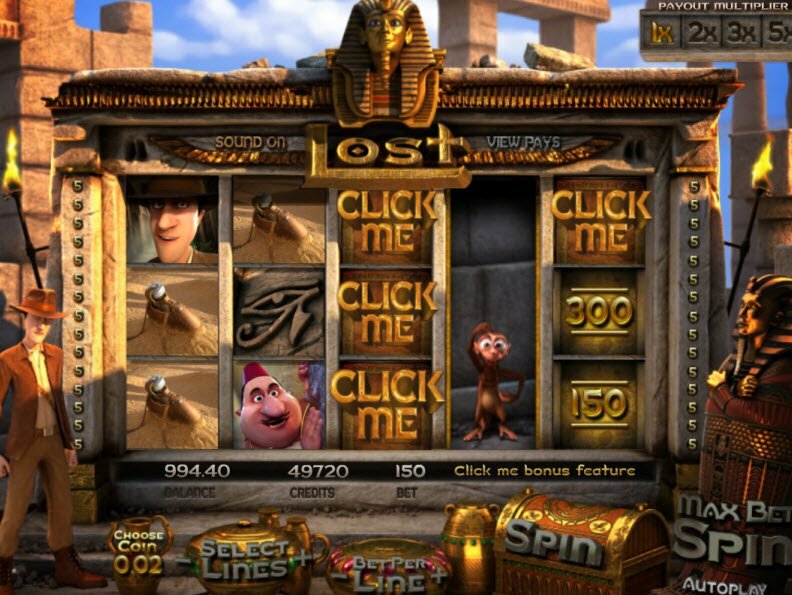 The Lost Slot Machine, powered by the Betsoft software platform, has a great package of 3D graphics and exciting features. Follow the relic hunter into the Pharaoh’s tomb. With each feature you experience new animations. During the Center Wild Feature, witness the mummy come to life and electrify. When the Monkey Click Me Feature activates, the monkey jumps around in an incredibly realistic manner. With graphics this good, you’ll think you’re really lost in the mummy’s tomb! The Lost Slot Machine has a great feature which gives you chances to earn even more money. Each time you achieve a winning combination, the prize pays out and the center reel respins for an instant chance to earn more wins. The Lost Slot Machine won’t let you down when it comes to bonus features. The Lost Slot Machine has a special Center Wild Reel Feature. If you get the staff symbol on any position on the center reel, the Center Wild Reel Feature activates. The Staff icon will then expand and take up the center reel, serving as a 2X Wild Reel for all symbols except the Bonus Round and Monkey Click Me Symbols. The monkey icon triggers the Monkey Click Me Feature. Get the monkey symbol on any position on reel 4 to trigger the feature. Then join the crazy monkey as he jumps around revealing prizes behind the symbols you choose to win prizes. The Lost Slot Bonuses have a great feature which gives you chances to earn even more money. Each time you achieve a winning combination, the prize pays out and the center reel respins for an instant chance to earn more wins. Each time the reel respins, the multiplier in the right corner increases up to 5X. If 4 of the Eyes of Horus symbols appear on the reel, you enter the Mummy’s Tomb Bonus. During this bonus round, help the relic hunter choose the door for prizes. Careful! You could find a mummy behind the door!